Staying Safe: How to Be Proactive about Your Well-being | Grand Central Magazine | Your Campus. Your Story. Recently, Mount Pleasant residents have received a wake-up call on personal safety. Several women have reported finding items on their car windshield or have noticed particular vehicles following them or being parked near their homes. Whether you’ve seen it on Facebook, Twitter or have had someone directly tell you about an incident, these perpetrators could’ve approached anyone. Hearing this and being a young lady has caused me to become much more aware of my surroundings and making sure my friends and roommates are safe. Simple steps can be taken to give yourself and your loved ones’ peace of mind when you’re out-and-about anywhere you go. Here are some tips. The most effective way to feel safe, while also scaring off any suspicious characters, is to travel in groups. Everyone can attest to the fact that being with at least one other person, male or female, makes them feel more at ease going out virtually anywhere. Sure, lone-wolfing your quick trip to the Target would be quicker if only you were going, but at the same time, you never know who’s watching in the parking lot. Altogether, matching up schedules so you can go places with your friends/roommates makes all of you feel more safe, not to mention you’ll save gas by carpooling while bonding with your buds. If there does come a day when your roommate cannot accompany you to the big sale at Kroger, employ the tried and true “mom mechanism” – text or call someone when you are leaving and arriving anywhere you go. Growing up, my mom would constantly remind me to let her know when I was leaving or getting somewhere so she could estimate how long the drive would take and if it took longer than normal, she’d know something was wrong. Same tactic goes for friends. Telling your roommate of your check pointed locations while travelling alone does the same thing. The previous tip is especially true when travelling after dark. The most vulnerable you can be in when you’re alone at night. Day light savings time helps a little with personal schedules because we have more time to get errands done during daylight so try to get anything you’ll need to do alone before the sun goes down. Whether its daytime or nighttime, there’s a few postures that will improve your chances of not being messed with. 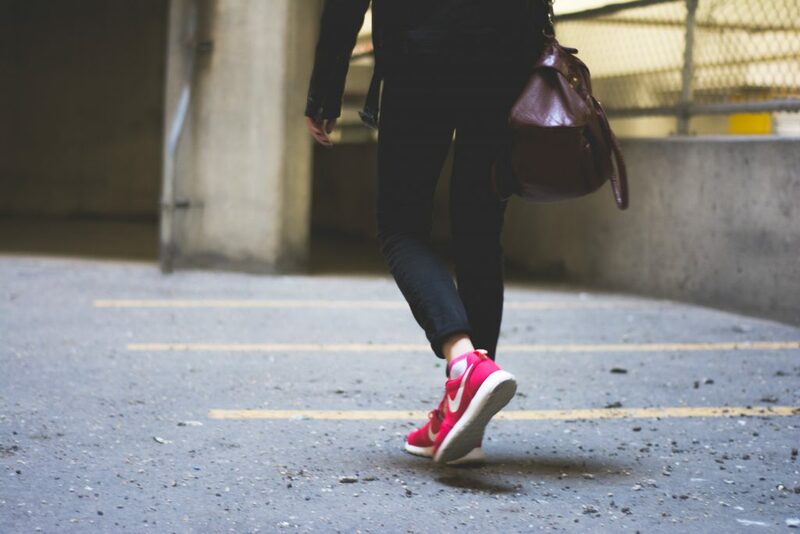 These include walking quickly and confidently, having tall posture and locking the doors of your car as soon as you get in. Predators are much more likely to approach someone who is hunched over texting on their phone and not paying attention to their surroundings. Would you mess with someone walking with that much alertness and demeanor in their walk? The latest sign that someone is being targeted by a predator is if they have some sort of object on their windshield. Should this ever happen, never touch the object. Leave it on your windshield and drive directly to the nearest police station. Report where you were, when you arrived and left, if you saw anyone or anything suspicious in the parking lot and any other helpful information you may have. With the paranoia heightened regarding people finding items on their cars or seeing familiar cars multiple times in a day, a physical self defense mechanism can bring personal peace of mind. Simply walking with your car or house key between your knuckles while holding a fist position gets yourself ready to pack a double punch should anyone come up to you. Popular among students is the pepper spray keychain that can easily be accessed anywhere anytime. These are sold around campus and Mount Pleasant and can be purchased on Amazon for about $10. A new, inexpensive and portable tool I’ve recently seen is a strobe-like flashlight. It’s an extremely strong LED flashlight that quickly flashes so the perpetrator becomes blind and disoriented. These can also be found on Amazon.com for about $15. With our society’s strong involvement with social media in 2017, we’re lucky to be aware that these incidents are happening everywhere and even in our town. They happen here, in your hometown, a few cities over, everywhere. From the few warnings that I’ve seen, we as an audience are lucky to be able to be aware this breach in safety and to know that the people that it’s already happened to knew what to do and are okay. These incidents have alerted something in all of us, and it’s up to us how we defend and keep safe ourselves and one another anywhere we go. Separator image Posted in Advice, Opinion, Opinion, Opinion & Advice and tagged with campus, Campus safety, Emily Oakes, how to, Safe.